The two Hungarians admitted their actions and were fined. 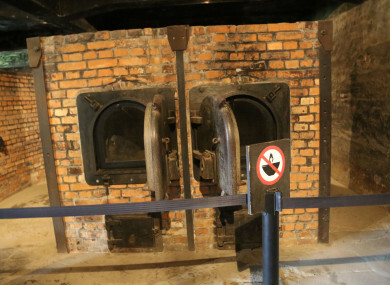 Interior of a crematorium at the Auschwitz-Birkenau extermination camp. TWO HUNGARIAN TOURISTS have admitted to trying to steal bricks from the ruins of a crematorium at the site of the former Nazi German death camp Auschwitz-Birkenau, according to police. The 30-year-old woman and 36-year-old man were caught yesterday when another pair of foreign tourists saw them stuffing the bricks into a bag and notified security. “The man and woman were charged with theft of a cultural asset. They both admitted to wrongdoing,” said regional police press officer Mateusz Drwal. “They explained that they had wanted to bring back a souvenir and didn’t realise the consequences of their actions,” he told the Polish news agency PAP. The Hungarian tourists were each fined 1,500 zloty (€350 euros) and handed a suspended sentence of one year in jail. Auschwitz-Birkenau has become a symbol of Nazi Germany’s genocide of European Jews, one million of whom were killed at the camp between 1940 to 1945. More than 100,000 others including non-Jewish Poles, Roma, Soviet prisoners of war and anti-Nazi resistance fighters also died there. Email “Tourists charged with stealing bricks from an Auschwitz crematorium”. Feedback on “Tourists charged with stealing bricks from an Auschwitz crematorium”.